Weather you have dreamed an intimate romantic wedding ceremony by the sea or a luxurious wedding, our venues offer the most elegant setting to celebrate your new beginning. We organise Informal & Civil Weddings, Greek Orthodox weddings and Renewal of Vows in a private ceremony at the hotel grounds or seaside. 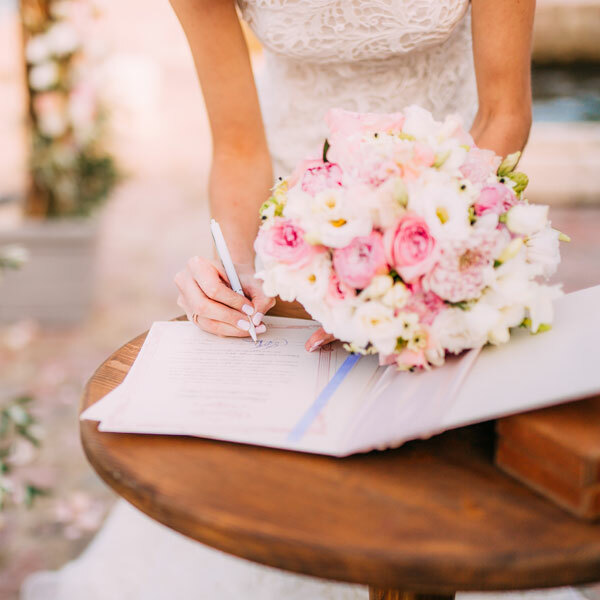 Plan an enchanted wedding day with the help of our experienced wedding planner, who will be personally dedicated to making your wedding dreams a reality. With a background of spectacular scenery, our legendary service and stunning event venues come together to create memories for you and your guests that will last a lifetime. As a prelude to the wedding celebration, our wedding packages will offer you faultless pampering , relaxing moments before the wedding and special retreats during your stay at the Stella Hotels. Pick one of the Stella Palace’s or Stella Island’s wedding packages and let the journey begin!